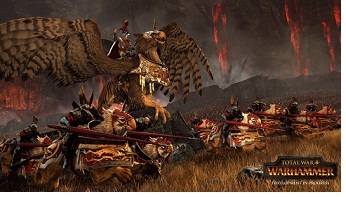 Are you more interested in diplomatic approach in Total War Warhammer, then empire will be best faction for your. The neighbors of the Empire are people and thus can be used for more than for fight. In addition, the military people are varied and allow you to respond to different types of enemies. Leveraging the numerous options, such as swords, spears, halberds, cavalry and ranged. The Empire has many enemies, what diplomacy cannot just simply make because where speeches does not help, awaiting the battle. As people known to be, always disagree, you also have problems in your own ranks, which the Empire weakens in Total War: Warhammer. Demigryph Knight: Shock cavalry with high strength of arms. Steam Tank: War machines with bonus range, armor and damage. The Luminark of Hysh: Magic chariot spread much damage at long range. A wide range of units can also be considered as a disadvantage. If you with the Empire you’ll find no middle ground for your infantry - either you decide on very strong or very weak units. However, there are good magicians among men, with many useful spells that you should not ignore. - Light Magician: Use these units, when you against vampire Counts. They are particularly vulnerable to magic and when their leadership falls. Thus new opportunities for the Empire open. - Swordsman: This unit proves at the forefront as particularly useful. - Spear Infantry: particularly well make this unit as an edge. - Fencing Master: you encounter enemy heroes, are you the fencing master of good service in order to weaken them. - Ranged cavalry: You will attack by opponent's monsters, use this unit to inflict high damage. - Cavalry: This unit is very expensive, yet strong and a good balance of the lack of air units in Empire.